Conor is a professional musician by trade with over twenty years experience playing guitar, extensively trained in music theory, sight reading, and ear training. He attended Rutgers University-Mason Gross for Jazz Performance under the direction of Vic Juris, and studies with Chris Buono as well. Conor has performed with such notable musicians as Bernard Purdie, Chris Buono, and Gerry Carboy. He has appeared as the lead guitarist for bands such as Big Baby Ernie (2003-2013, during which he played five tours in the United Kingdom), Katfish Lucy (2013-present), Hive Mind (2015-present), The Blues Collar Band (2015-present), and The Hard Pack (2015-present). He has been teaching guitar lessons in Ocean County since 2003. 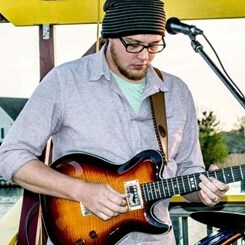 Conor is passionate about all music genres, and is especially skilled in soloing, improvisation, and band accompaniment. Teaching guitar has been an extension of this passion in the hopes of sharing and spreading the love of music. Request Lessons with Conor McCarthy today!